Design Works - Landscape Architecture & Const. Design Works is an award winning New Hampshire Landscape Design AND Build Firm with a deep focus on professionalism, artistry through design, excellence in craftsmanship, and client satisfaction for our clients in southern NH and northern Mass. We are committed to creative and logical designs that enhance your ability to enjoy all that New England’s landscape environment has to offer in the comfort of your own backyard. Our specialty is designing and constructing residential landscapes, outstanding outdoor living spaces, and gardens as a single package, providing collaboration with our clients through all phases and aspects of the landscape project. 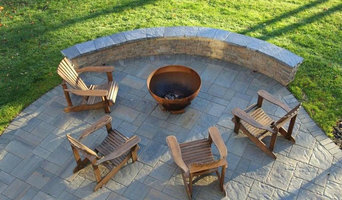 Our main services include guided pool & patio planning, patios and backyard gardens, walkways and front yard gardens, outdoor kitchens/fireplaces/fire Pits, retaining and seating walls, LED landscape lighting, paver driveways, and fencing. We are a third generation family business and our team offers 10+ years of professional experience using industry construction standards, which is backed up by invaluable education and licensure in landscape architecture. We look forward to working with you to make your landscaping ideas and landscape dreams become a practical and achievable reality. Design / Build Landscape Architecture specializing in residential properties. 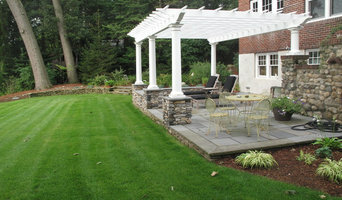 A complete design / build landscape company that caters to the discerning homeowner in and around Andover, MA. With over 45 years experience, Seoane Landscape Design is one of the leading Landscape Design and Contracting Companies in the South Shore and Metro Boston area. Our business is distinctive among other landscape contractor companies because our professional designers have the ability to reach a clear understanding for the needs of our clients. Seoane Landscape provides; realistic, functional designs and precise execution on every project. Our turn-key operation means that every phase of work is done "in house." Whether Seoane is building stone walls, installing backyard pools, laying a bluestone patio, constructing an outdoor kitchen or planting specimen trees - the work is completed by our own skilled and experienced craftsmen and landscape contractors. Project Management, Landscape Design, Pool Design, Pools, Cabanas, Pool House, Pool Patio, Backyard Retreat, Landscape Planting, Stone Walls. Our goal for every project is to find the right balance between our client's lifestyle and their outdoor environment. We create comfortable, inviting, functional and sustainable outdoor living spaces. Although unique to every project our design style has been described as "comfortably modern with an intuitive sensitivity to the traditional New England vocabulary". The work of this outdoor professional includes most everything surrounding a home's exterior. A landscaping architect can even work with the home architect to choose the right spot for your Burlington, MA house. From there the Burlington landscaper will develop preliminary concepts for your front or backyard design based on individual needs including the climate and activities that will take place, as well as layouts and planting plans. Landscape architects will also design any structures or outbuildings that will be added to the space. Any grading changes that will be added to the yard are also the responsibility of the architect. This includes any drainage modifications. An engineer can also be responsible for these tasks, but licensed Massachusetts landscapers are fully capable. Like building architects, they will produce preliminary concept drawings as well as detailed construction documents and planting plans. Three-dimensional renderings and illustrative plans are all supplementary. A Burlington landscaping designer generally will have ecological, aesthetic and technical training, which helps them maximize the potential of your outdoor space. Keeping in mind both style and functionality, garden designers analyze your architecture and yard to produce a plan that may or may not include location and materials for walkways, patios, water features, fences, garden aspects and more. In addition, a landscaper in Burlington, MA will carefully assess your geographic region to choose plants, trees and flowers that will flourish naturally, as well as address concerns such as drainage, screening and soil conditions. Certain landscape designers only help with the planning portion, while some may deliver the plans and then oversee a hired landscaping contractor. Others — typically following a design-build approach — take care of both the design and all aspects of the landscape architecture and construction. Before you hire a Massachusetts professional landscaper, consider the scope and emphasis of your outdoor project. Landscape architects, who typically hold advanced degrees in their field, are trained to develop comprehensive structural plans that include plants, hardscaping, water use, drainage and more. Landscape designers typically specialize in the aesthetic and horticultural, rather than structural, side of yard and garden planning. They might or might not have advanced training. Even within their fields, a garden designer may specialize in hardscape- or vegetation-focused designs. In some cases you might need to hire additional help to get the outdoor space you want. Here are some related professionals and vendors to complement the work of landscape architects & landscape designers: Landscape Contractors, Garden & Landscape Supplies, Tree Services, Gardeners, Lawn Care & Sprinklers, Decks, Patios & Outdoor Enclosures. Find a Burlington landscape architect on Houzz. Narrow your search in the Professionals section of the website to Burlington, MA landscape architects and designers. You can also look through Burlington, MA photos to find a space you like, then contact the professional who posted the photo.